The next time you’re at the Uniqlo building in BGC, go up. It might not seem like it (you have to go through the Uniqlo store front to get to the elevator), but there are other non-clothing joints hiding atop the building. On one side is an electronic darts bar, and the other is Alegria, the first sangria bar in BGC. Once you pass it, you can’t miss it. Its name is spelled out in boldly lit letters at the bar, right on top of skull-faced tiki mugs glowing from the bar light. 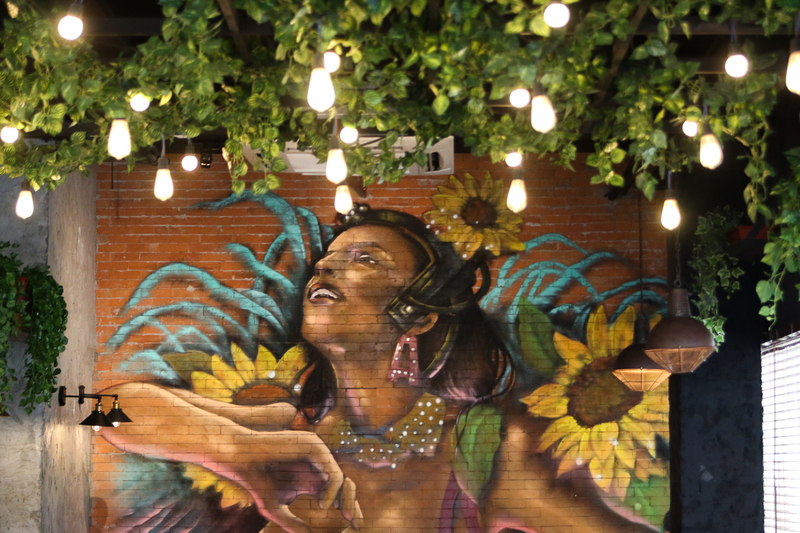 Its interiors is also distinct; there are hanging leaves on the walls and on the ceiling, and one corner is covered in exposed brick painted over with a figure of a woman—reminiscent of some of the graffiti laden streets of South America. 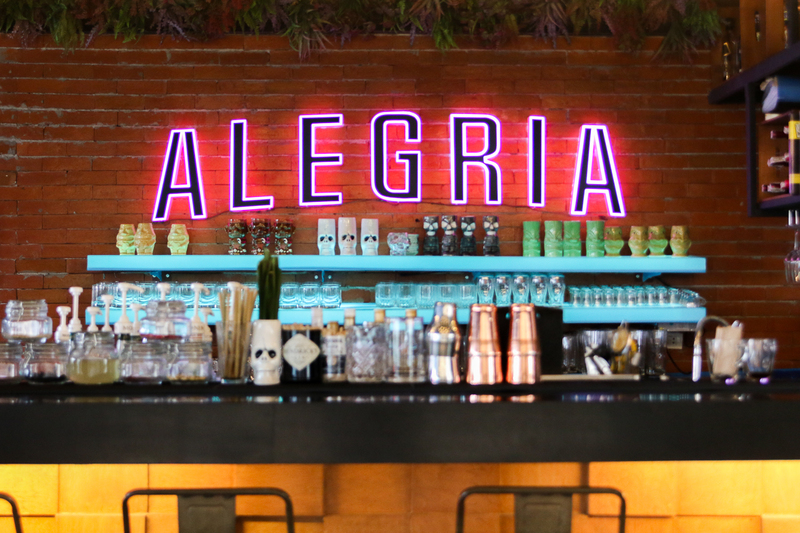 As you might tell by its name (full title is Alegria Conzinha Moderna & Sangria Bar), Alegria is a Latin American bar and restaurant. 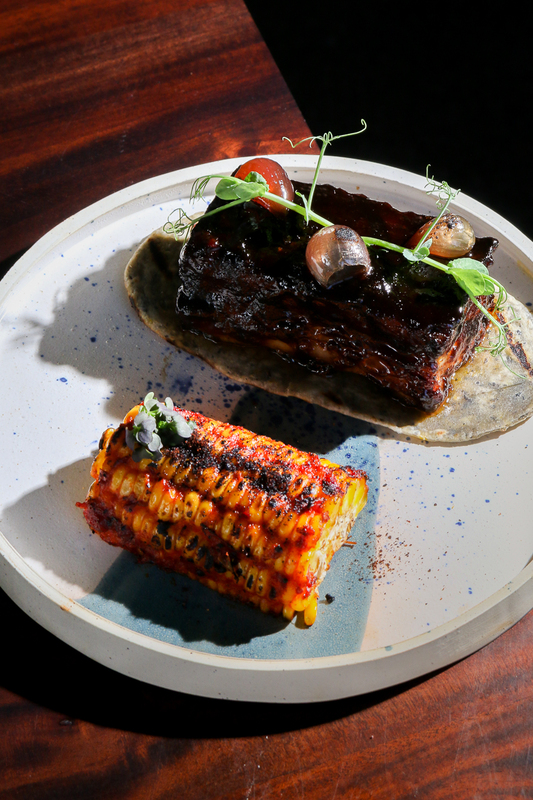 Started by young chef Charles Montanez, the place serves the regional cuisine with a more modern and sophisticated touch, while still fitting in with the Filipino palate. You can see it, of course, with their sangrias, and how they up the ante by introducing unique flavors into the drinks. They also frequently use untraditional wines for the mix: instead of the usual red rioja, some of the sangrias are made with cava or rosé. 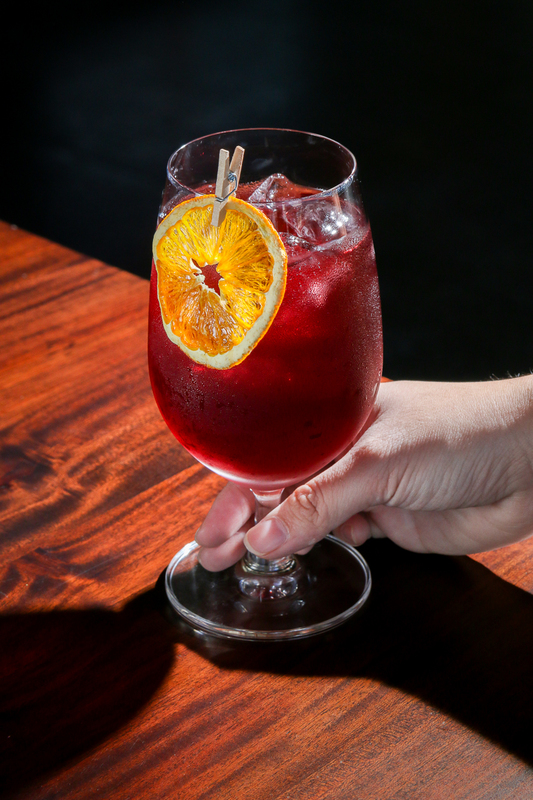 If you’re in the mood for a more traditional sangria, try the amora. Coming in a seductive cherry red color, the drink is made of red wine, gin, blackberry, and lavender. It’s the classic red sangria, deceptively light and punchy. The fruitier drink, on the other hand, is la quica. 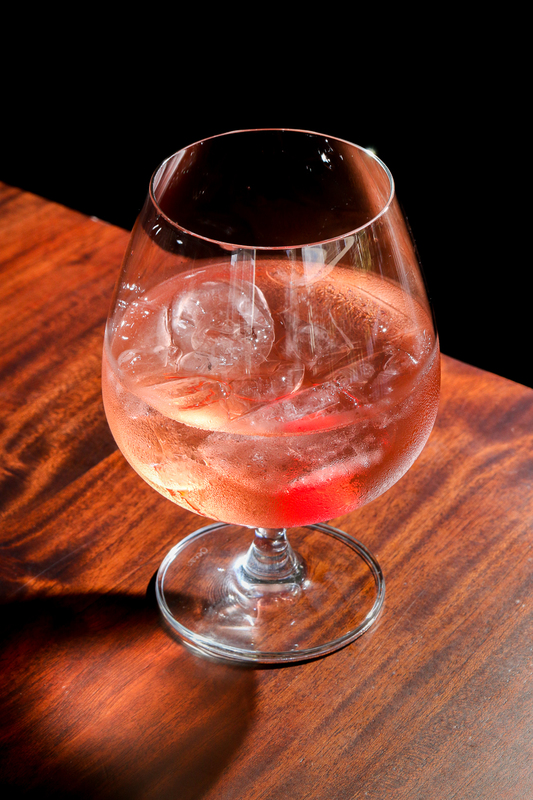 It’s one of the drinks that uses rosé, and it contains peachsnapps and cherry blossoms. It’s a sweeter, more delicate drink, and though it’s lighter than the amora, it’s still as much a treacherous drink. Sangria has a bad rap for being a “girly” drink (let’s leave the conversation on why weaker drinks shouldn’t be associated with women and how a drink being light and fruity shouldn’t be seen as a bad thing for another time), but Alegria makes a case otherwise. 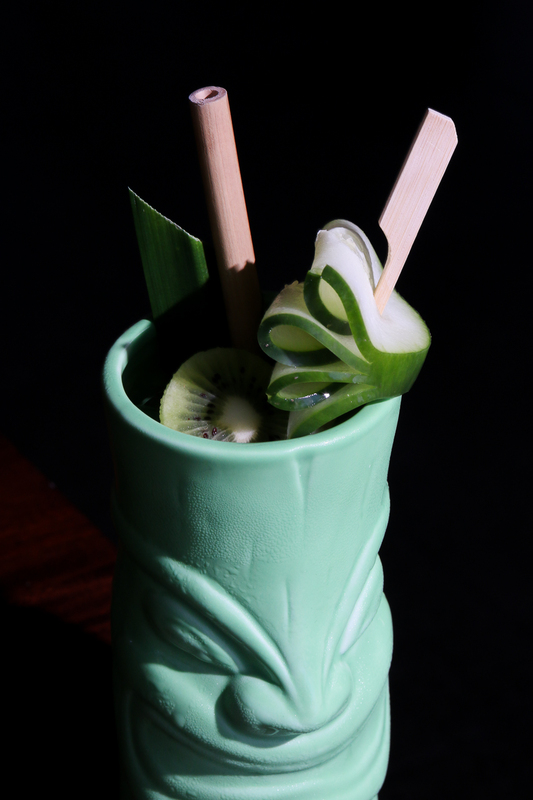 Verde, one of the drinks that comes with a tiki mug, is a sangria made white wine, rum, apple, kiwi, and cucumber. It’s a sangria that doesn’t try to mask the hardness of the rum, and you feel every bit of its strength with each sip. Even so, it’s still fruity, and the kiwi and cucumber mix is an odd but welcome choice. Though Alegria made waves as the first sangria bar, the bar was more of an afterthought compared to the dishes. And their philosophy of doing something new and untraditional definitely carries through to the food, especially with the new items they added to their menu this year. Out of the new dishes, the moqueca is probably the most emblematic of this. 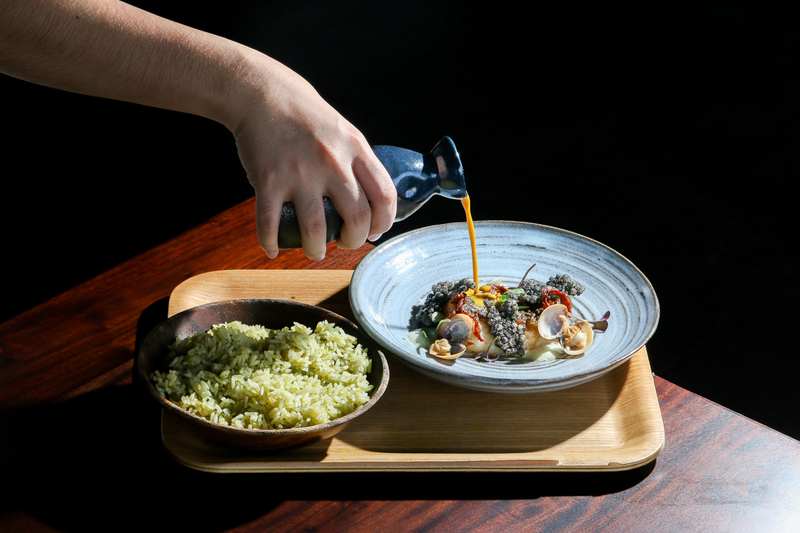 Based on the traditional Brazilian seafood stew of the same name, Alegria’s moqueca is a deconstructed version, with squid ink and tapioca balls fried into a cracker, as well as sous vide bacalao tuna. The dish comes with their special chimichurri ginger rice, and the stew’s soup comes in a separate jar. 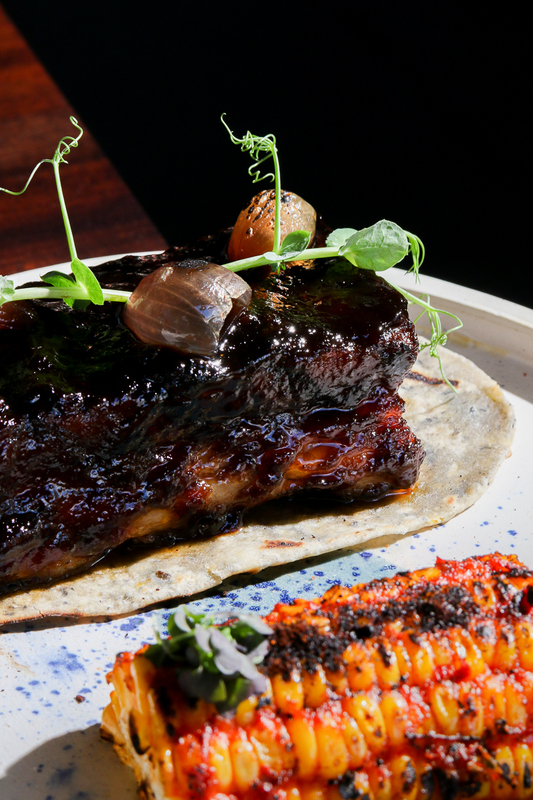 If you’re looking for a heartier meal, the posta negra huarache is the way to go. A Colombian-style braised beef dish, the black angus roast beef is smoked for ten hours, and its pinto bean and corn sauce is made with cola. The addition of the cola makes the meat taste sweet, sour, and salty all at once, not unlike the local humba, though more powerful. The meal is served with a knife, but you can just as easily cut the beef with a fork because of how soft it is—it’s like cutting through butter. You’d be remiss to ignore the appetizers, which are also pretty solid in their own right. The ceviche is a straightforward app. 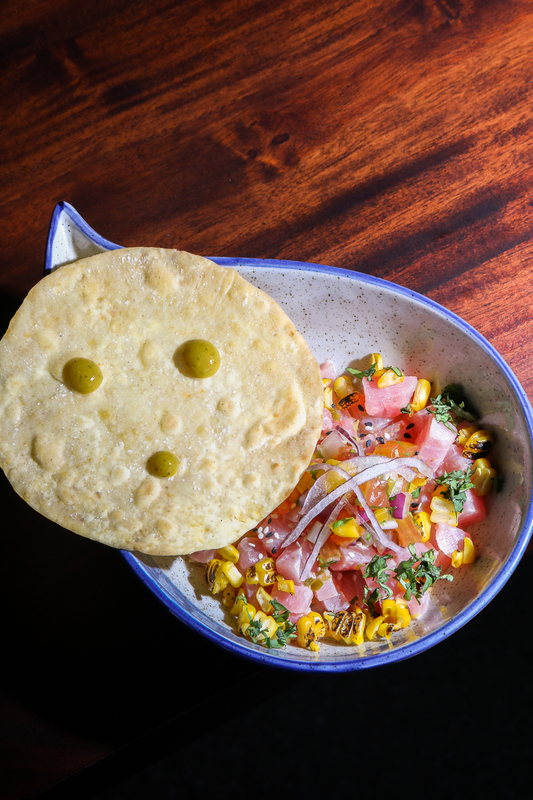 Served with a tostada shell, the “body” uses tuna with mango salsa and cilantro chutney, and the agua is made with ponzu and lime, resulting in a very clean tasting dish. In contrast, the agua chile de camaron is an explosion of flavor. It’s an inflated tortilla containing grilled pineapple and shrimp cured in agua chile. It’s fruity and crispy without losing the shrimp’s flavor. 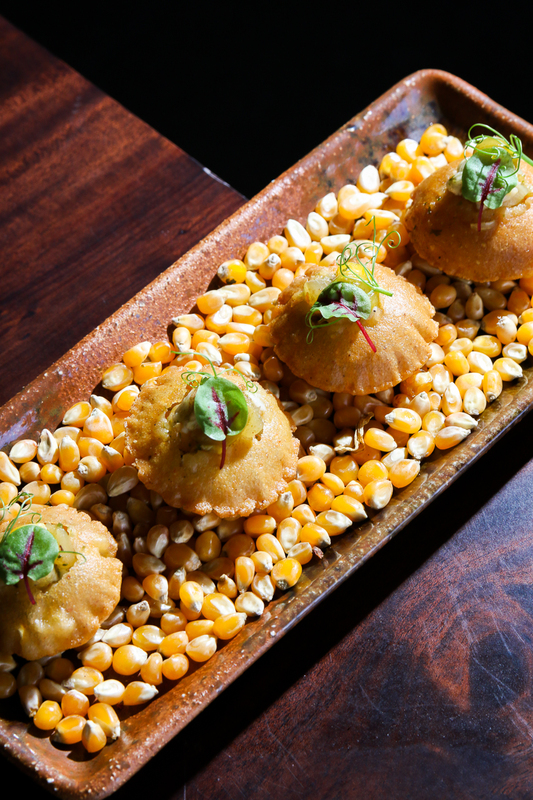 The elote con chicharones is a busier app, with adobo cracklings-filled filet mignon served in skewers. It comes with chimichurri rice, which complements the savoryness of the filet mignon. The star of this plate, it must be said, though is the elote, the grilled corn coated with cheesy crema and cilantro. This being a Latin American restaurant, you can’t leave without trying the tacos. 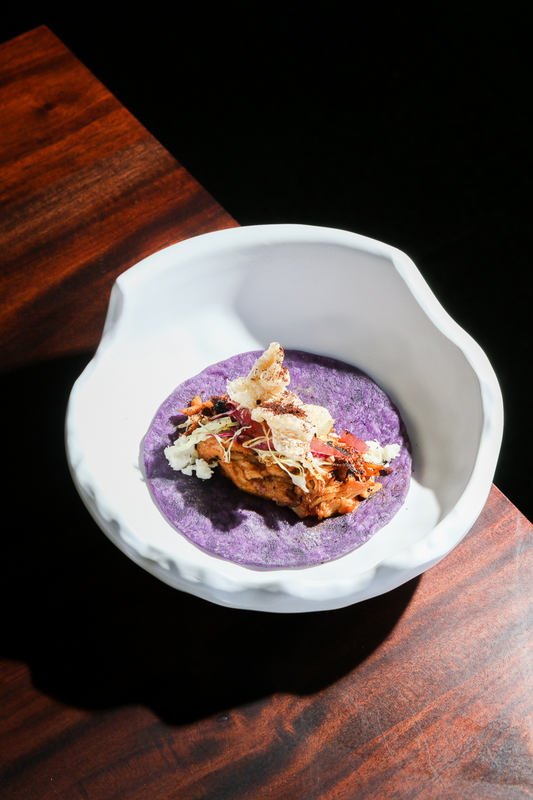 The el mexicano comes in a distinctive purple yam tortilla, and the sweet pork carnitas is season with dried chilis that are flown all the way from Mexico. 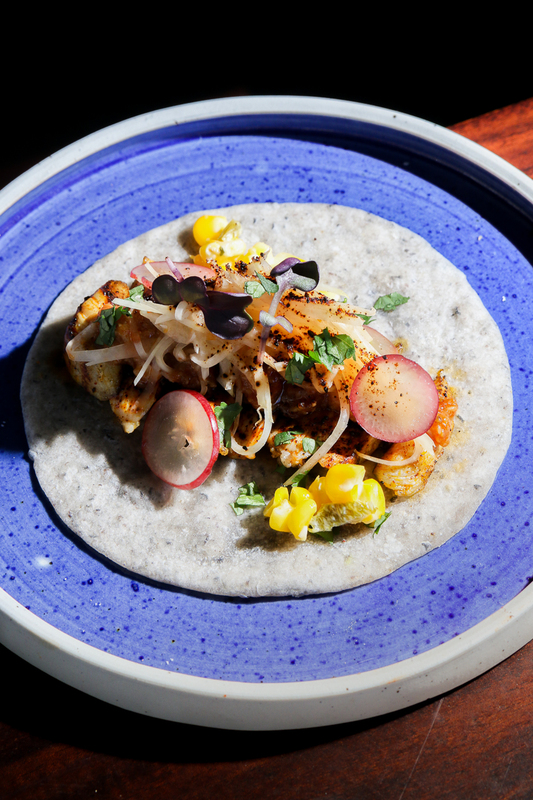 Meanwhile, the barbacoa is a sweet and sour chicken taco, and it contains smoked grapes and pickled papaya. To top off the Alegria experience, get a plate of their dessert taco. 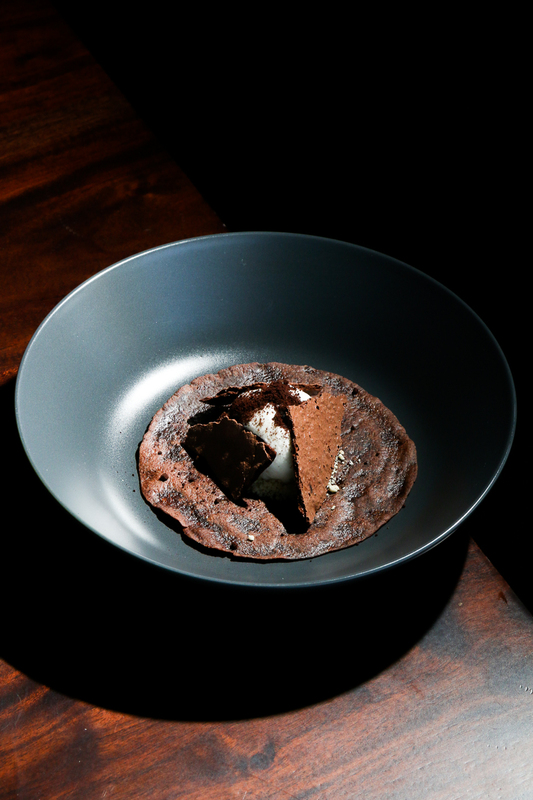 Called the “Foi Mal!” taco, it’s a chocolate tortilla topped with vanilla ice cream and shards of chocolate. Eating it is somewhat like eating an ice cream sandwich, and it’s just as comforting (probably why it’s called “Foi Mal!”, which loosely translates to “my bad”). 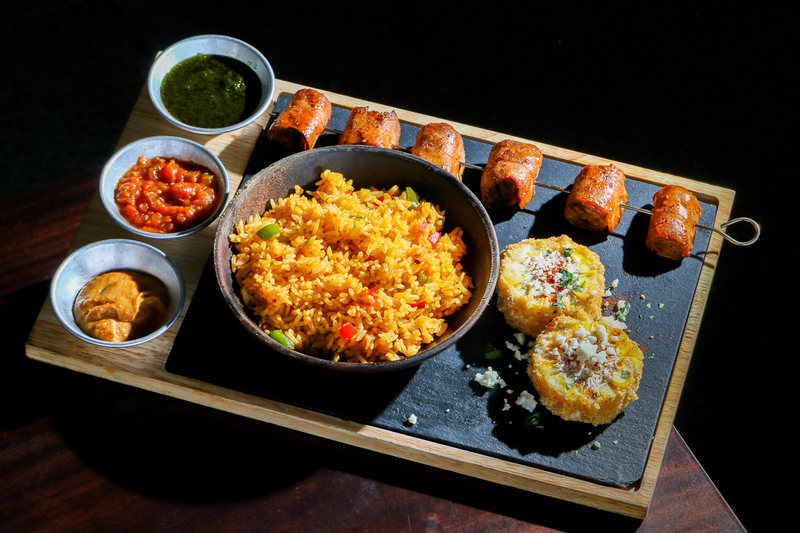 Alegria roughly translates to joy, and you can tell that there was a lot of that in the creation of the dishes, what with their inventiveness and creativity. Whether you want to get sangria-drunk (which in Alegria means getting drunk faster than you thought you would), or just want a good Latin American meal, the cozy dive atop Uniqlo isn’t a bad choice.